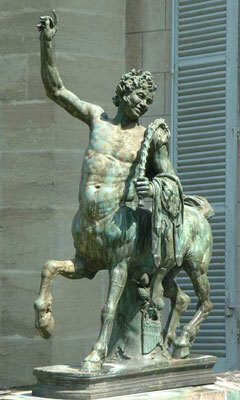 Centaur mythology revolves around half-horse / half-human creatures whose origin is little understood. I'll be blunt, in ancient Greek mythology centaurs are basically frat boys with horse bodies. I'm talking the body of a horse up to its neck, then the torso, head, and arms of a total jerk of a human being. In general they were wild and rude, loud and unruly, and generally just liked to run around the countryside getting drunk and being profane. There was one key exception and that was Chiron, who was pretty much the exact opposite of all the other centaurs. He was smart, well-spoken, skilled in art and music, and on top of it all he was kind and friendly to all humans. People liked Chiron so much that the higher class citizens, including many of the demi-gods, had him tutor their children. Among the more famous names were Aesculapius, who became the god of medicine, and the immortally strong Hercules. Chiron is often mistakenly credited as the figure in the Sagittarius myth, when he is actually the figure in the constellation Centaurus. Either way he is the exception to the centaur rule. The rest of his kind were loud, obnoxious, and often drunk. One famous story told of Hercules swiping some centaur wine and getting into a huge brawl over it. The lesson? Never take a drunk's wine. Especially that of someone who is half-horse. Later legends show more evolved centaurs who are not quite as wild, but just as dangerous. These centaurs are more focused hunters, though for the most part they aren't particularly crazy about humans. Except for Amazons. Apparently, Amazons, the wild warrior women of myth, play a key part in late centaur mythology. They are the lovers of male centaurs. Try not to picture what that looks like, it's probably illegal. There's not a lot more to say about them other than the fact that despite being legendary monsters from thousands of years ago, most people know enough about centaur mythology to at least know what a centaur is. That's actually a pretty good accomplishment. If you don't believe me, ask the next person you see if they know what a centaur is. Chances are they might not know their history, but they'll know they are half-men/half-horses. Then ask that same person what a basilisk is. Both creatures are from the same era known to many of the same ancient peoples, but the truth is that most people won't know what you are talking about. And by now they are probably going to be looking at you funny wondering why you are asking them such strange questions. The point is - centaur mythology has been around for a very long time, and shows no sign of going away any time soon. Return from Centaur Mythology to the List of Mythical Creatures.